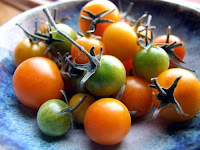 A month ago, just before the frost hit, I went and picked all the green tomatoes on my sungold plants and brought them inside. This is the first year that my little potted tomatoes produced enough fruit that there was any left at the end of the season, so this is the first time I've tried ripening green tomatoes indoors, and it seems like some kind of impossible magic trick. The skin is a little tougher than vine-ripened tomatoes, and they aren't quite as flavorful, but still--ripe, local tomatoes in Duluth in November. 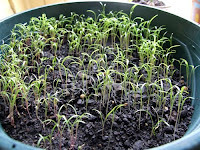 Back in late September, I planted two pots of dill and basil seeds to see if I could grow them indoors through the winter. I probably should have started them a touch earlier, and I should be giving them some supplemental light now (they're just indoors in a south-facing window), but I am happy to report that they have sprouted and are growing. The dill is actually doing surprisingly well. The basil is a bit slower. I'll try to rig up some light for them (or pray for more sunlight; it's been overcast for the better part of the past month). My parsley and rosemary from last summer are still chugging along, and my parsley from two summers ago (2008) actually looks better than my parsley from this past summer. Or at least that's what it looked like before the wind kicked up again and ruffled the edges. The geometry of it in this photo makes me think it's some Andy Goldsworthy installation. 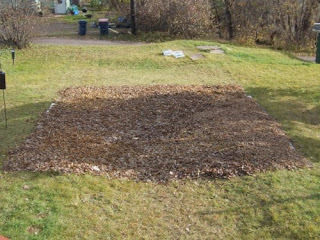 What it actually is is flattened moving boxes put down to blot out the turf grass, a little bit of topsoil (and by "a little bit" I mean 560 pounds, but that's spread over about 450 square feet), and then 11 garbage bags full of leaves on top of that (with thanks to freecyclers and coworkers for the leaves; I have no big deciduous trees in the yard yet). In the spring hopefully the grass will be dead and the leaves and cardboard should be rotted enough that I can dig through without tilling. I dislike machines and would like to get by without rototilling if Ican. I'd post a picture of what my compost bin looks like now, but it's just a pile of lumber with a few pieces nailed together. I'm going to try to finish it up this week or the next so that I can stop throwing perfectly good garbage in the landfill. Once I can start composting, I should be able to cut my garbage pick-up back to every other week. Ooh, I'm excited about the tomatoes. We just finally took all of the green grape tomatoes off of the vine and brought them indoors. We have them in a paper bag on top of the fridge, and I hope they ripen. I'm so happy for your garden, it will be gorgeous. Have you ever heard of "fried green tomatoes"? In the deep south, tomatoes grow year round, but sometimes hard frost threatens and you've just got to pick a bunch and that's when it's time for fried green tomatoes. You slice 'em up, dip 'em in egg wash and bread and they are yummy deep fried.